Audi UK is adopting an agency model for its fleet sales from 1 April, aimed at offering more stability for dealers and clarity for customers, while supporting a growing model range and changing buyer habits. The move brings Audi in line with the rest of the Volkswagen Group. The change follows a 12-month consultation process working with leasing companies, corporate partners and the dealer network, and brings Audi in line with the rest of the Volkswagen Group, which means the systems and processes are already in place. Head of fleet, Tom Brennan, told Fleet World it would give greater control over fleet sales, while providing better clarity of terms and service for customers and offering direct ordering for leasing companies. Vehicle handovers will take place at dealers, who will receive a handling fee for doing so. He explained that increased market pressures and wider competition, as well as changing buying habits, such as brokers and online sales, and 200% growth in the SME and retail contract hire sector over the last two years had all created a catalyst for change which had been discussed but hadn’t been needed before. 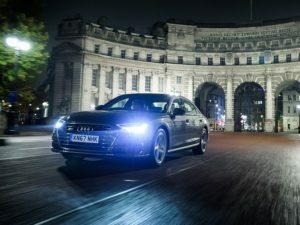 The re-shaped business arrives as Audi embarks on a product offensive which will launch a new car every three weeks during 2018; core models including the A1, A6, A7 and Q3 will be replaced, while newcomers will include the luxury Q8 SUV, and the electric E-tron SUV before the end of the year. Brennan said the breadth of the range meant it was increasingly able to be a solus supplier for fleets. Despite this, there are no plans for growth during 2018. Brennan said the company had reduced short-cycle volumes last year, with a focus on sustainable volume – 80% of the company’s UK sales are in retail or true fleet, and the aim is to maintain its 9.7% share (increased from 9.3% in 2016) of the latter during 2018, against the backdrop of a declining UK market.